fun | Interiors By Design, Inc.
One of our favorite areas to design in a home is the “Kid Space”. There tends to be more whimsy in the design as imaginations soar. Colors, fabrics and patterns are often bright, bold and playful. Basically, we get to be kids again! Our philosophy is that form always follows function, so the most important aspect of our design is that we meet the client’s needs. We believe there are 3 main functions of a “Kid Space” and we design accordingly. #1 All kids need to read (or be read to), so make sure to incorporate a comfy spot with books close at hand. #2 All kids need to develop fine motor skills so let’s make it fun! Drawing, coloring, painting, building blocks and legos are all great ways to help master those skills. Your “Kid Space” should definitely have an area for this type of creativity. #3 All kids develop socially through imaginative play. In your design, include an area as simple as a box with dress-up and costumes or as elaborate as tents, kitchen sets and pretend workshops with tools. 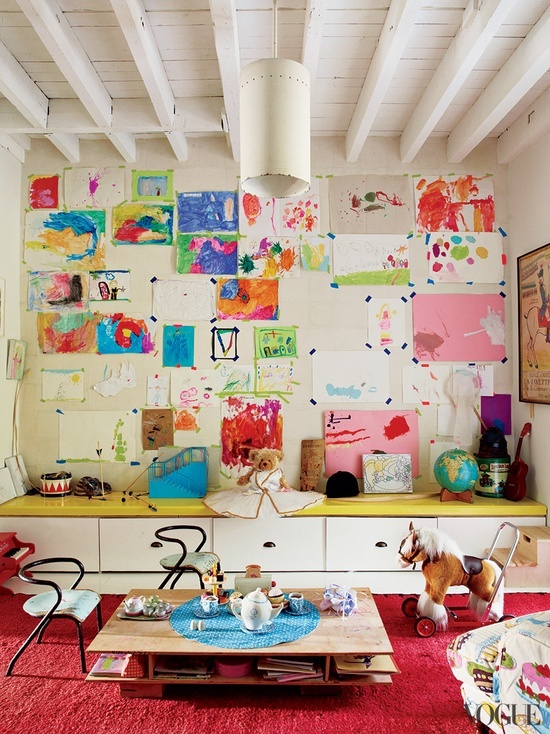 There’s nothing more inviting than a sweet space for kids where their imaginations can run wild! One last tip…Make sure you hang or display all the masterpieces and creations. Kid art trumps all design rules!